Sight-impaired artist H. Eric Hartman is a native of New Orleans. He grew up on the banks of Bayou St. John in the shadows of City Park’s moss-laden Live Oaks and Magnolia trees that surround the New Orleans Museum of Art. Although he always exhibited artistic talents, a rare degenerative eye disease, Choroideremia, greatly discouraged his pursuit of a career in art. He reluctantly decided to pursue a Banking career, relegating Art to a hobby. 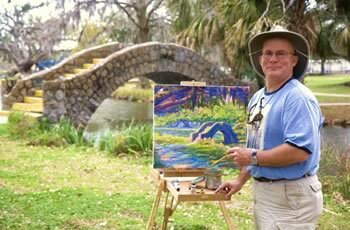 During his 15 years in Banking, Eric’s passion for art grew while his peripheral vision disappeared leaving him legally-blind with only extremely limited central vision and severe night-blindness. Finally realizing that his artistic talents were a Gift that must be pursued, he opened his art studio in 1995. His total loss of peripheral vision simply meant that there were fewer distractions. Papier-Mâché sculptures became his passion. Self-taught, he worked for 10 years as a sculptor achieving first regional and ultimately national recognition for his work. Eric left New Orleans in 1997 on a four year sojourn to Cape Cod and New England. He turned his artistic endeavors towards oil paintings under the tutelage of the noted Cape Cod artist, Arnold Demarais, in classes held on the Cape and in the South of France. He traveled throughout the New England region, experiencing and painting the both beauty and colors of the Four Seasons and the majesty of the Atlantic Seashores. Returning in 2000 to his true home, Mid-City New Orleans, Eric has continued to paint. Sensing that he was being drawn more towards Impressionism, he has also studied extensively with Lois Griffel, director of the Cape Cod School of Art and author of Painting the Impressionist Landscape. In 2003, he spent two weeks in the mountains of Jackson Hole, WY studying with Scott Christensen, an nationally award-winning Landscape artist and author of On Distant Ground, The Art of Scott Christensen. In 2004, Eric’s painting of “Return of the New Canal St. Streetcar at Mandina’s” has been purchased by the New Orleans RTA for the cover of the invitations to the Canal Streetcar Grand Opening Celebration. The end August 2005 brought the death and destruction of Hurricane Katrina. The Hartman Family was lucky & survived. However, his mom’s home on the Gulf Coast disappeared and two sisters’ homes flooded. Eric’s apartment building also flooded on the first floor. He evacuated with his family before the storm hit. He was not able to return home for 90 days until his building was habitable. His “evaporation” took him across the country going to Florida, to his cousin’s in Georgia, then a few weeks with friends in Chicago and finally being taken in for two months in Sonoma, CA by the West Coast Toons (a greater group of friends can’t be found!). Returning to Mid City’s flood ravaged streets, Eric painted and adjusted to the vacant streets. Two and a half years later, much of Mid-City has finally been restored. Neighborhood icons reopened. Life goes on by the Strength and Soul of the citizens that have returned! In the summer of 2006, Eric took a break from the ugliness of the gutting homes and spent two months painting across France. It was an challenging sojourn for a sight-impaired guy travelling alone with all his art supplies. But he successfully made it with no more than the usual blindie bumps here and there. 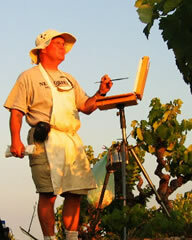 Trading paintings for accommodations, Eric stayed with friends and others while being able to paint plein air daily in fields and streets across Provence, Clermont-Herault, Paris, The Loire Valley and the Riviera. It was a true gift to have made such a trip! He returned to ‘Nawlins renewed and inspired to paint. 2008 has seen many things happening for his artwork. Synovate, a worldwide marketing research corporation, chose Eric and 39 other New Orleaneans for a worldwide Charity art auction on Ebay May 23-30th. Then, Mid-City’s annual music festival, The Bayou Boogaloo, chose his painting “Super Sunday Mardi Gras Indians on the Bayou” as its Official Fest Poster… Eric’s first poster commission! Additionally, the New Orleans Home and Lifestyles Magazine chose Eric to be the featured artist in their June 2008 issue! His works have been selected for numerous national art exhibitions, including successful openings in Chicago, Washington, DC and Sonoma, CA. His works are privately held from the White House to the Wine County of California and internationally from Australia to England. Rich in the traditions and cultures of Southern Louisiana and drawing from his travels, Eric draws his inspiration for his paintings from the natural beauty he sees around him. To help fight for a cure for Eric’s eye disease go to curechm.org.